Talking about "Mediterranean cheese" as if it's a distinct variety is problematic for two reasons. First of all, almost all of the best cheese-producing countries in the world surround the Mediterranean Sea: Spain, France, Italy. Second of all, cheese originated in the nomadic sheepherding cultures that lived in the region east of the Mediterranean, so to some extent all cheese is Mediterranean. Still, when we use the term "Mediterranean cheese," we are typically referring to a select group of eastern European and Middle Eastern cheeses, typically made from goat or sheep's milk, typically fresh or pickled (but not aged), and typically really delicious. Here are some of my favorites. 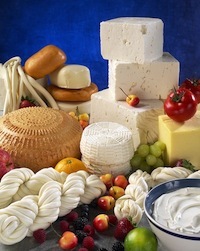 Feta is probably the most famous of the mediterranean cheeses. It is made from sheep or goat's milk, and pickled in brine (saltwater) for a period of several weeks. The best feta will have a distinct "gamy" flavor, which, in my mind, is offset a bit by the high levels of salt in the cheese. I love cooking with Feta, since it crumbles really easily (no grating! ), doesn't really melt, and adds lots of umami to your food. Feta also pairs really nicely with fruit that's sweet and juicy, like watermelon. I've been a big fan of String cheese ever since I was a kid. And I'm not talking Polly-O here, I'm talking about Middle Eastern-style braided String cheese, usually studded with black cumin seeds. The cheese is made in a way similar to Mozzarella cheese, by pulling and stretching the curds like taffy. My favorite way to serve this cheese is to spend wayyyy too much time pulling all the little strands apart and placing them in a serving bowl. Trust me, it tastes better that way. Labne is a cheese made from strained yogurt, which renders it much thicker, more spreadable, and closer to cream cheese (but without cream cheese's fatty heft). I love serving labne with olive oil and za'atar, and eating it up on a piece of pita. It's also a really good lighter substitute for sour cream. Thanks to the fine folks at Karoun Dairies for providing samples for me to taste in writing this post.